Integrate your Facebook account with Rank Ranger for enhanced Facebook Analytics reports that can be viewed in our marketing platform, white label client dashboards and automatically sent in white label PDF format to your clients and managers. Facebook indicates that their Insights metrics are only generated for a Facebook Page that has more than 100 people that like it. Likewise, demographic metrics, such as age, gender and location, are available in Page Insights once there is data for 100 or more people. Facebook requires that you be a Facebook Page Admin and logged into your Facebook account in another tab / window prior to connecting the account to Rank Ranger (or ask an Admin to authorize the Rank Ranger connection for you). Facebook requires that connections to external applications be renewed approximately every 60 days. We send automated emails 14 days before the connection is expected to expire, with a link directly to the Authorized Connection page where you can click a Renew button to prevent expiration and ensure reports contain the data you expect. You must be a Facebook Page Admin in order to authorize data integration. Confirm your status as a Page Admin: when viewing the Facebook page of the company, organization or product, you should see a Settings option in the upper right of the screen. If you do not see the Settings option then you will need to ask the page owner to make you a Page Admin. If you do see the Settings option, then click it. Navigate to the Page Roles screen and confirm that you are a page Admin, as opposed to Editor, Moderator, Advertiser or Analyst. If you are not listed as a Page Admin then you will need to request a role upgrade from an existing Page Admin or ask an Admin to authorize the Rank Ranger connection for you. In order to provide your with Facebook reports and tools, Rank Ranger requires your authorization to receive your public profile information, access your Page and App insights, ads and related stats for display in your social analytics reports in our marketing platform. Authorization also enables you to post to your Facebook Page, read and respond to messages and manage ads through our app. Rank Ranger will receive your public profile information: you may click the review the info our app will have access to and click the Okay button if you agree. Authorizing Rank Ranger to post to Facebook enables you to post to your Facebook page and respond to messages using our app. Only you (and your account sub-users if you authorize them) will have the ability to enter and post content. Select the list that you want to share posts on your page with and click the Okay button. Click the "Choose what you allow" link to view the details of each permission. Review each permission and click the Okay button when you've completed your choices. You can add as many Facebook accounts and pages to Rank Ranger as you'd like, so we recommend that you name each connection for easy identification when connecting to rank tracking campaigns. After authorizing integration of your Facebook account to our app, you need to connect a Facebook account, page and ad profile (ads are optional) with a rank tracking campaign. In the Select Connection Name for Facebook field, click the down arrow and select the appropriate Facebook account. When the account connection has been completed, you will see a Select Page menu. Select the Facebook page that corresponds to the campaign and click the Connect button. When the connection is successful, you will see the Facebook account avatar and name (if you don't then you need to click the Connect button). When a Facebook Ad account is successfully connected the ad account number displays. To switch to a different Facebook account, click the Disconnect link and repeat the campaign, page or ad account connection. Click the View Report link to launch the Facebook Insights Overview report. You'll find additional Facebook reports and tools in the left sidebar of the Reports > Social Analytics screen including Facebook Post impressions and performance, Facebook audience analytics, Facebook Page messages and timeline, and Facebook Ads. New Likes: the number of new people who have liked the Facebook Page. Page Checkins: the number of times that people have indicated in a Facebook post referencing the Facebook Page that they visited the business or organization's physical location by utilizing the checkin option in a personal post. Page Mentions: the number of mentions of the Page that are attributed to your ads. A mention happens when a person types @ followed by your Page name, then selects your Page name from a list, in a Facebook post or comment. Page Stories: the number of stories created about the Page. Unlikes: the number of Unlikes of the Page (e.g., users who previously Liked the page, and later clicked the Unlike this Page option). Organic Impressions: the total number of unique people who were show your Page post through unpaid distribution. Post Likes: the total number of unique likes per post. Post Shares: the total number of times someone shared a Page post. Posts by a Page: the number of times content posted by a Facebook Page has been referenced on another page. Posts by People on a Page: the number of times that people posted on a page. Post Type: Facebook's categorization of the post type can be link, photo, status, etc. Targeting: audience segments defined for post ad distribution. Facebook requires a personal user account login with Page Admin role in order to integrate their Page Insights and Ad performance report data with Rank Ranger. According to Facebook, Business Manager permissions cannot be used for access to reporting data via the Facebook Page or Ads Reporting API. Facebook Business Manager helps businesses and agencies manage Facebook Pages, ad accounts and apps in one place. 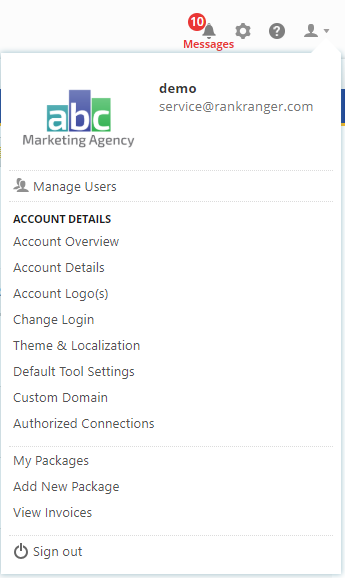 Business Manager API's can help manage multiple ad account assets and permissions. You can also automate creating ad accounts. Reporting data is not currently available via the Facebook Business Manager API, if that changes in the future our development team will research and implement the appropriate options for our users.